siddhakarana: DVCON India 2014 : Event Recap! 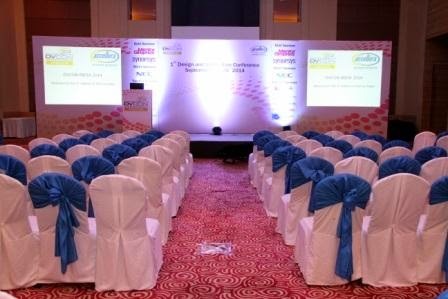 DVCON India 2014 : Event Recap! It’s been a week and we are still receiving messages and emails on the success of the first edition of DVCON in India. The campaign kicked off a few months back and the team put in relentless efforts for the success of this event. There was an overwhelming response from the ESL and DV community once the call for abstracts got announced. Panelists in both the tracks conducted multiple reviews for every paper and after long discussions the chosen ones were intimated for the presentations. The content of the papers were a clear indication of the quality of work and due diligence that is put in by engineers in this geography. Abstracts were submitted from authors outside India too and many traveled to present it on Sept 25-26 2014. When I reached early morning the corridors, the halls and the stage were all set to kick start the 2 days filled with learning, sharing and networking. While the registrations (paid) prior to the event indicated expected numbers, scores of spot registrations further added the icing to the cake. Interestingly, the halls were full by 9:30 AM and the program kicked off in time with the lamp lighting ceremony and welcome note from Umesh Sisodia – Chair DVCON India 2014. Dr. Walden C. Rhines – CEO Mentor Graphics mesmerized the crowd with his keynote on 'Accelerating EDA innovation through SoC designmethodology convergence'. We couldn’t have asked for a better start! Next, Dr.Mahesh Mehendale - CTO, MCU at Texas Instruments threw an excellent insight on 'Challenges in the design and verification of ultra-low power “more than Moore” systems'. The mood of the conference was all set with the success of the first session. The conference bifurcated from here into ESL and DV tracks with interesting topics getting discussed as part of invited talks. During teak breaks, lunch hour and evening cocktails, the long galleries were full with chit chat between engineers, exhibitors and poster presenters. After lunch, 4 tutorials started in parallel with industry pundits talking about technologies that are into mass adoption and what to look for next. All sessions were jam packed with audience eager to ask questions during the sessions and continue that inquisitiveness till the day wrapped up with informal meetings during the cocktail. DAY 2 witnessed the same zeal and enthusiasm. It started off with Ajeetha Kumari – Vice Chair, DVCON India 2014 welcoming the audience followed by Dennis Brophy – Vice Chairman Accellera sharing insights on different working groups within Accellera and inviting engineers to actively participate and contribute. Next was the guru Janick Bergeron – Verification fellow, Synopsys talking about 'Where is the Next Level of Verification Productivity Coming from?' The morning session wrapped up with keynote from Mr. Vishwas Vaidya – AGM, Electronics, Tata Motors discussing 'Automotive Embedded Systems: Opportunities and Challenges'. From there on, it was the papers & posters running into 4 to 5 parallel tracks with engineers sharing the challenges they faced and the solutions they discovered as part of this process. Yes there was an award for the same and the judges were none other than the audience themselves casting their vote by end of all sessions. The crowd continued to stay back anxious to know the results and participate in a series of lucky draws that followed. While a wide variety of topics got covered on DAY 2, the results were all in favor of UVM papers clearly confirming of what Dr. Wally Rhines presented as a starting point that India leads in adoption of System Verilog and UVM across the world (based on a latest survey). By the Day 2 evening the corridor, the halls and the stage were silent again, maybe exhausted of experiencing the 2 day long sessions, maybe enjoying the recap of the eagerness shown by 400+ delegates, maybe feeling proud of their contribution to the history for hosting the first DVCON in India. Many congratulations for those who were able to experience the event and be part of this historical moment. Live tweets for the event can be searched with #DVConIndia on twitter. The proceedings, photographs and videos of the event will be made available soon on the official website www.dvcon.in. If you missed this year, make sure you make it for the next year event which would be surely bigger & better!!! Yours truly presented an invited talk “...from Nostalgia to Dreams ...the journey of verification” on DAY 1. Stay tuned for a few blogs from that discussion! Verification claims 70% of the chip design schedule!